Ertz, M., Durif, F., and Arcand, M. (sous presse) “A conceptual perspective on collaborative consumption,” Academy of Marketing Science Review. https://doi.org/10.1007/s13162-018-0121-3. Hallegatte, D., Ertz, M., et Marticotte, F. (sous presse) “Blending the past and the present in a retromarketing music concert offering: The impact of nostalgia proneness,” Journal of Product & Brand Management. Hallegatte, D. (2018), « Nostalgie 2.0 », Organisations & Territoires, 26(1-2), pp. 165-184. 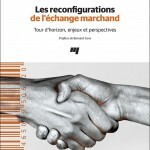 Ertz, M. (2017), “Consommation collaborative ou la rencontre improbable entre organisations, communautés et individus,” Organisations & Territoires, 26(1-2), 151-164. Ertz, M., Huang, R., Jo, M.-Y., Karakas, F. et Sarigöllü, E. (2017) « From single-use to multi-use: Study of consumers’ behavior toward consumption of reusable containers, » Journal of Environmental Management, 193, pp. 334-344. http://dx.doi.org/10.1016/j.jenvman.2017.01.060. Bousquet, J., et Diallo, T. (2018). Performance d’équipe de sport professionnel et rémunération des entraîneurs : le cas de la LNH (Ligne nationale de hockey). Revue de Management et de Stratégie, 1-8. Jiao, Y., Ertz, M., Jo, M.-S., et Sarigöllü, E. (2018) « Social value, content value, and brand equity in social media brand communities: A comparison of Chinese and US consumers, » International Marketing Review, 35(1), pp. 18-41. 10.1108/IMR-07-2016-0132. Bousquet, J., & Diallo, T. (2017). Rémunération et congédiement des entraîneurs-chefs sur la performance d’équipes de sport professionnel: cas de la Ligue nationale de hockey (LNH). Revue Organisations & territoires, 26(1-2), 91-99. Cova, V., Bousquet, J., Claveau, Ç., et Shabir, A.Q. (2018). The changing dichotomy between the sacred and the profane: a historical analysis of the Santiago de Compostela pilgrimage. Journal of Management, Spirituality & Religion. https://doi.org/10.1080/14766086.2018.1501415. Ertz, M., et Leblanc-Proulx, S. (2018) “Sustainability in the collaborative economy: A bibliometric analysis reveals emerging interest,” Journal of Cleaner Production, 196, pp. 1073-1085. https://doi.org/10.1016/j.jclepro.2018.06.095. Ertz, M., Rouziès, D., et Sarigöllü, E. (2017). « Comment le bien-être des salariés génère de la rentabilité, » Harvard Business Review France.